Anopheles mosquitoes transmit malaria which is one of the world’s most threatening diseases. Anopheles dirus (sensu stricto) is among the main vectors of malaria in South East Asia. The mosquito innate immune response is the first line of defence against malaria parasites during its development. The immune deficiency (IMD) pathway, a conserved immune signaling pathway, influences anti-Plasmodium falciparum activity in Anopheles gambiae, An. stephensi and An. albimanus. The aim of the study was to determine the role of Rel2, an IMD pathway-controlled NF-kappaβ transcription factor, in An. dirus. RACE (Rapid amplification of cDNA ends) was performed on the Rel2 gene. Double-stranded Rel2 was constructed and injected into the thorax of female mosquitoes. The injected mosquitoes were fed on a P. falciparum gametocyte culture and dissected on day 7–9 post-feeding in order to count the oocysts. A survival analysis was conducted by exposing the dsRNA injected mosquitoes to Gram-positive and Gram-negative bacteria. This study demonstrated that the Rel2 gene in An. dirus has two isoforms, short length and full length. RNA interference-mediated gene silencing of Rel2 showed that the latter is involved in protection against P. falciparum, Gram-positive bacteria (Micrococcus luteus) with Lys-type peptidoglycan and Gram-negative bacteria (Escherichia coli) with DAP-type peptidoglycan. This study suggested that there are similarities in the splicing events and functionality of the Rel2 gene, between the Anopheles species. Among all the important anophelines, the immunity of only a few has been thoroughly investigated. In order to develop novel vector-based control strategies and restrict malaria transmission, the immune pathways of these important vectors should be thoroughly investigated. Malaria, caused by the protozoan parasites Plasmodium spp., is among the world’s most life threatening infectious diseases. About 70 species of Anopheles are capable of transmitting malaria . Nearly 2 billion humans are at risk of contracting malaria in the South East Asia Region (SEAR) . Anopheles dirus (sensu stricto) (s.s) (species A) is an important vector and can be found in Thailand, Myanmar, Cambodia, Vietnam and Laos . The highly anthropophilic nature of An. dirus A is also one of the reasons for this species being the main malaria vector in Thailand [3, 4]. A multifaceted approach would be required to curb the disease, especially in light of recent problems that include drug-resistant parasites and insecticide-resistant mosquitoes . Insect immunity exclusively relies on the innate immune response and is devoid of the adaptive immune response. The model organism for the insect immunity, Drosophila melanogaster, has provided insights on the two main regulatory pathways, Toll and IMD. In Drosophila, the NF-kβ factors associated with the Toll pathway are Dif and Dorsal, whereas Relish (Rel) is involved in the IMD pathway [6, 7]. In An. gambiae, Rel1 is an analogue of Dif, and Rel2 is the orthologue of the Relish gene [8, 9]. The most effective anti-Plasmodium immune factors, TEP1, APL1, LRRD7 and FBN9, are all regulated by the NF-kβ Rel2 transcription factor [10–13]. In Anopheles, the Rel2 gene undergoes alternative splicing to produce a full-length form (Rel2-F) and a shorter form (Rel2-S). The full-length form consists of the Rel-homology Domain (RHD), carboxyl-terminal ankyrin (ANK) and death domains, whereas the shorter form lacks these inhibitory domains. The Drosophila IMD pathway is activated against Gram-negative bacteria and some Gram-positive bacilli, which contain diaminopimelic acid (DAP-type) in their peptidoglycan (PGN). On the other hand, fungi and Gram-positive bacteria with lysine (Lys-type) in the PGN switch on the Toll pathway [6, 14]. The PGN-recognition proteins (PGRPs) in An. gambiae and Ae. aegypti activate the IMD pathway, irrespective of the type of PGN present  . In this study, we elucidated the role of Rel2 in An. dirus (s.s) by using RNA interference (RNAi) during Plasmodium falciparum and bacterial infections. Anopheles dirus A (WRAIR2) strain from Malaria Research and Reference Reagent Resource Center (USA) was colonized in the lab using the forced copulation technique. The mosquitoes were maintained at 25 °C, relative humidity of 85 %, with a 12-h light/dark photocycle and fed on a 10 % sucrose solution. A short conserved region of Rel2 (241 bp) was amplified by designing primers based on the GenBank sequence for An. quadriannulatus (Accession No. EU304622.1), An. coluzzi (Accession No. KP274426.1), An. gambiae M isolate (Accession No. GU990219.1) and An. merus (Accession No. KP274430.1). Rel2 forward and reverse primer sequences: 5′-CAA GTT TCG CTT CCG CTA CCA G-3′ and 5′-ACC CAC ATC CAG ATC GTG-3′. Total RNA from adult female mosquitoes was extracted using ReliaPrep™ RNA Tissue Miniprep System (Promega, Fitchburg, USA) according to the manufacturer’s instructions. The extracted RNA was used as the template in SMARTer™ RACE cDNA amplification kit (Clonetech, Mountain View, USA) to obtain the full cDNA sequence. The sequence obtained from Rel2 PCR was utilized in designing primers for RACE. The gene specific primers (GSP) and nested gene specific primers (NGSP) used to amplify the 5′ and 3′ RACE products are shown in Table 1. The sequence obtained from RACE was used to construct double-stranded RNA using the T7 Megascript Kit (Ambion, Foster City, USA). A 445 bp Rel2 region was amplified and the amplicon was ligated downstream of the T7 promoter in the pGEM®-T Vector (Promega) to produce sense and antisense RNA strands. Approximately 50–200 nl of dsRNA (2 μg/μl) was injected into the thorax of anesthetized 2–4 days old female mosquitoes by using InjectMan® NI 2 (Eppendorf, Hamburg, Germany) and FemtoJet® express (Eppendorf) with Femtotips® I (Eppendorf) microcapillaries. The dsLacZ (441 bp) was used in the control injection. The primers used for the construction of dsRel2 and dsLacZ are shown in Table 1. The cDNA was synthesized using the QuantiTect® Reverse Transcription (Qiagen, Hilden, Germany) according to the manufacturer’s instructions. A reverse transcription quantitative PCR was carried out using the iQ™ SYBR® Green Supermix (Bio-Rad, Hercules, USA) on CFX96™ Real-Time System, C1000™ Thermal cycler. The primers are shown in Table 1. All qPCR reactions were performed in triplicates. The melting curves were obtained for each data point to validate the specificity of the PCR reactions. The expression level of Rel2 in dsRel2-treated samples was compared to that of dsLacZ-treated samples by normalizing the cDNA levels using the ribosomal protein S7 gene. Gametocytogenesis in the NF54 strain of P. falciparum was induced using an established protocol . On day 16, the culture was pelleted and resuspended in an equal volume of heat-inactivated human serum before transferring to a membrane feeder set at 37 °C, and fed to mosquitoes (injected with dsRNA on day 12 of the P. falciparum culture). The fully engorged female mosquitoes were maintained at 25 °C for 7–9 days. Mosquitoes that survived were dissected and the midguts were stained with mercurochrome to check for oocysts. Analysis of the infection prevalence was performed using the Chi-square test whereas for oocyst infection intensity, it was determined by the Mann-Whitney U test. The experiment was performed with at least 3 biological replicates and the data were pooled if there was no significant difference between the replicates within the dsRNA treatments. Escherichia coli and M. luteus were cultured to OD600 0.7, pelleted, washed and resuspended in PBS. The final OD600 for infection was 0.4 for E. coli and 0.1 for M. luteus. Four days after the dsRNA injection, mosquitoes were infected with the bacteria by inserting Femtotips® I (Eppendorf) microcapillary in the bacteria culture and poking it in the mosquito’s thorax. The adult mosquitoes that did not recover after 3 h of being exposed to the bacteria were not considered for the analysis. Dead mosquitoes were counted daily and recorded for 10 days. At least three independent experiments were performed, each with at least 25 female mosquitoes per group. The survival analysis was performed using Kaplan-Meier log-rank test. Four days after the dsRNA injection, RNA was extracted and converted to cDNA to be used in reverse transcription quantitative PCR. The primers shown in Table 1 were used to determine the Rel2 silencing efficiency. The 2−ΔΔC T method was used to determine the relative gene expression of Rel2 with S7 as an endogenous reference gene. At least triplicates were performed in the RT-qPCR reaction. The knockdown efficiency calculated was 64.6 % (Fig. 1). In order to investigate the function of Rel2, an RNAi mediated gene silencing approach was used. RACE results showed that Rel2 has two transcripts: a short (Rel2-S) and a full-length form (Rel2-F). The length of the short form (Rel2-S) was around 1.7 kb whereas the full length (Rel2-F) covered approximately 3.2 kb. Since dsRNAs act only against mRNAs that contain the corresponding sequence , the dsRel2 construct was designed to silence both forms of the gene by targeting the 5′ region of the short and full length transcripts. The strain of P. falciparum used for infection in this study did not have an unnaturally high infection level in the mosquito . In order to obtain a substantial infection, the P. falciparum culture at 0.3 % gametocytemia was fed to the mosquitoes . A higher gametocytemia (≥ 2 %) resulted in infection rates that were undetectable in both groups of dsRNA-treated mosquitoes. 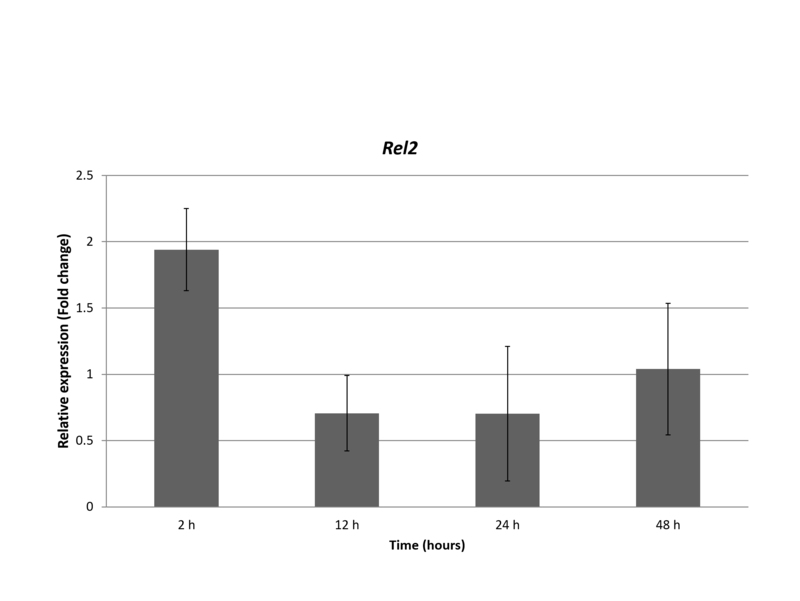 Time point gene expression experiments conducted at 2, 12, 24 and 48 h post P. falciparum blood-feeding showed that Rel2 is upregulated the most (1.94-fold) at the 2 h interval (Additional file 1: Figure S1). Silencing the IMD pathway factor, Rel2, produced a phenotype that led to a significant increase in infection prevalence as compared to the dsLacZ-treated controls (χ 2 = 5.39, df = 1, P = 0.020; Fig. 2). The dsLacZ-treated controls had a median oocyst number of 1, with infection prevalence of 21.4 %, while the dsRel2-treated mosquitoes had a 2-fold greater median oocyst number of 2 and an infection prevalence of 37.2 %. Furthermore, the knockdown of Rel2 also resulted in significantly higher oocyst infection intensity (Mann-Whitney U = 144.0, P = 0.0013; Fig. 3). The potential role of Rel2 in the defence against bacterial infection in adult mosquitoes was investigated through RNAi analysis. Two to four day-old female mosquitoes were injected with dsRNA and exposed to E. coli (Gram-negative) and M. luteus (Gram-positive) after 4 days. RT-qPCR was used to confirm the knockdown of the Rel2 transcript. The preliminary infection experiments suggested the use of O.D600 = 0.4 for E. coli  and O.D600 = 0.1 for M. luteus. The mosquito survival study was conducted for 10 days after the bacterial infection. Rel2 knockdown severely compromised the survival of the adult mosquitoes when exposed to E. coli (χ 2 = 8.19, df = 1, P = 0.004; Fig. 4a). A similar trend was observed during the M. luteus infection in the Rel2-silenced mosquitoes when compared to the dsLacZ-treated controls (χ 2 = 5.05, df = 1, P = 0.025; Fig. 4b). It is relatively much more convenient to conduct experiments on naturally mating strains compared to colonies maintained through forced copulation. The degree of penetration of the microcapillary in the thorax of the mosquito had an immense effect on the mortality rate, post-injection. Adept and experience in the use of the micromanipulator improves mosquito survival rate to more than approximately 80 %. The limitation during the injection process was the varying volume of dsRNA injected; the volume was estimated by dividing the volume of dsRNA loaded in the microcapillary with the total number of injections possible, at the set parameters. In the Drosophila model system, Dredd cleaves the ankyrin repeat region of the Relish gene, resulting in the translocation of the active form of Relish into the nucleus to activate the IMD pathway . In Aedes, the orthologue of Relish, Rel2, has one additional alternatively spliced transcript than that of Anopheles, encoding only the ANK domain . Since Rel2-S cannot be targeted specifically without affecting Rel2-F, the distinct roles of each are still not evident. However, the Rel2-F can be independently silenced to elucidate the function by targeting the region encoding the ankyrin repeats. One study reported Rel2-F as having no effect on the prevalence of P. falciparum infection . Hemozoin treatment was shown to induce the full length form of Rel2 and reduce P. berghei infection in An. gambiae . Garver and colleagues showed that Rel2-F had a mild effect on P. falciparum oocyst intensity in An. gambiae, which was not as potent as the Rel2-S and Rel2-F combination . Even though the Toll and Jak-Stat pathways are involved in providing protection against P. berghei, P. falciparum and P. vivax [26–29], the IMD pathway has come out as the most effective against human malaria . Our results also demonstrated that dsRel2-treated An. dirus mosquitoes have a significantly higher P. falciparum prevalence and oocyst infection intensity. Anopheles gambiae was shown to have an average of 2.2 oocysts per midgut after being infected with P. falciparum . The knockdown of Rel2 in the Ngousso mosquito strain showed an increased susceptibility to P. falciparum in terms of infection prevalence . Silencing the negative regulator (Cactus) of Rel2 or overexpressing the Rel2 transcription factor provides nearly complete refractoriness in laboratory reared An. gambiae, An. stephensi and An. albimanus against cultured P. falciparum . The overexpression of Rel2 in the midgut tissue of An. stephensi following a blood meal also resulted in inefficient invasion of the ookinetes . Silencing Imd, Fadd, Dredd and Rel2 had a significant effect on the infection intensity, but only the silencing of Rel2 had a significantly higher infection prevalence . An upper limit for gametocyte density exists, beyond which the infection rates plummet [31, 32]. It seems that the low gametocyte density is an evolutionary mechanism to guarantee fertilization. The high gametocyte densities are extremely rare and probably of little significance epidemiologically. This explains the absence of oocysts when the mosquitoes were fed at a higher gametocytemia. The position of the primer plays a pivotal role in detecting the accuracy of silencing in a given sample  because some primer sets may be able to bind to the cleaved products and amplify them, resulting in an underestimation of the silencing efficiency . The primers targeting the 3′ end of the mRNA might give false negative results, probably because of the presence of secondary structures or RNA binding proteins . Therefore in this study, the primers were designed away from the 3′ end of the Rel2 mRNA and downstream of the region targeted by the dsRel2 (Fig. 5). However, it is not always possible to cover a specific region of the mRNA because of the thermodynamic limitations posed in primer design for RT-qPCR. Our results help to explore whether the role of Rel2 is conserved among different malaria vectors. There may well be differences among the anopheline species in some elements of these downstream mechanisms, but the collective effect results in an anti-Plasmodium falciparum immune response; the presence of multiple factors working in tandem would make it highly unlikely for P. falciparum to acquire resistance against this pathway . In Drosophila, activation of the Toll or the IMD pathway depends on the detection of the PGN on the bacterial surface by the PGRPs. The Toll pathway is responsible when the Lys-type PGN is recognised by the PGRP-SA and PGRP-SD, whereas the IMD pathway is activated upon recognition of the DAP-type PGN by the PGRP-LC. However, the PGRP-LC in An. gambiae acts as the main receptor for Lys-type and DAP-type PGN and activates the IMD pathway via translocation of Rel2-F and Rel2-S into the nucleus, respectively . RNAi-mediated knockdown of Rel2 in Ae. aegypti demonstrated a greater mortality to Gram-negative bacteria Enterobacter cloacae and the Gram-positive Enterococcus faecalis . Our results showed that Rel2 provides protection against DAP-type Gram-negative and Lys-type Gram-positive bacteria. Since the AMP genes such as Defensin, Cecropin, and Gambicin can be induced and regulated by both, Rel1 and Rel2 , it is possible that Rel1 can contribute to providing protection against certain PGNs, albeit at a lesser extent than Rel2. Since the dsRel2 in this study targeted the common domains of the Rel2-S (short form) and Rel2-F (full length), there is a possibility that the Rel2-F also has the potential to act against the pathogen/parasite. Therefore, in order to investigate the function of Rel2-F, it has to be independently targeted. Although all human malaria species of Plasmodium are found in SEAR, P. falciparum and P. vivax are the most prevalent, with the latter species contributing more to the clinical cases currently . However, the biggest threat in this region remains the emergence of P. falciparum resistance to artesunate . In SEAR, the number of anopheline species poses a serious problem for malaria control programmes. The results presented in this study explore the role of Rel2 in an important vector in SEAR and adds to the growing information about mosquito immunity. Evidence from previous studies and this one portrays the significance of Rel2 against P. falciparum and bacterial infection. Nonetheless, Rel2 has the tendency to affect non-immune genes and the upregulation of the transcription factor may inadvertently have an impact on mosquito fitness and fecundity . Further research has to be conducted to fully comprehend the ramifications of altering the natural gene expression of the mosquito. A thorough investigation of the Jak-STAT, Toll, and IMD pathway in the anopheline species would serve as stepping stone towards generating parasite resistant mosquitoes. We would like to thank ATCC for providing An. dirus WRAIR2 live eggs and Plasmodium falciparum NF54 strain. This study was funded by University of Malaya High Impact Research Fund (UM.C/HIR/MOHE/MED/16) from the Ministry of Higher Education, Malaysia. The funders had no role in study design, data collection and analysis, decision to publish, or preparation of the manuscript. The datasets supporting the results are included within the article and its Additional file 1. The partial Rel2 gene sequence data has been deposited in the GenBank database under accession number KU601345. MKB and YLL conceived and designed the study. MBK, JKL and CSL performed the experiments. MBK and YLL analyzed the data, drafted the manuscript and helped in manuscript revision. All authors read and approved the final manuscript. The study was carried out in strict accordance with the recommendations in the Guide for the Care and Use of Laboratory Animals of the National Institutes of Health. The protocol was approved by Institutional Animal Care and Use Committee, Faculty of Medicine, University of Malaya with the ethics number: 20150407/PARA/R/MBK.